Roma have seen their Brazilian custodian spark plenty of interest. 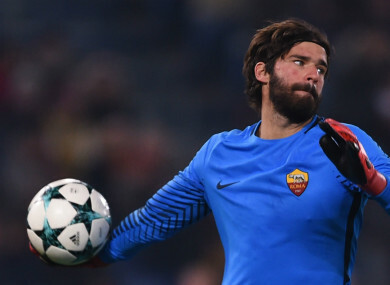 LIVERPOOL TARGET ALISSON is “the Lionel Messi of goalkeepers” and will cost “far more than €50m”, says former Roma coach Roberto Negrisolo. The Brazil international has emerged as a much sought-after commodity after shining for club and country. With Jurgen Klopp set to be in the market for a new keeper this summer, Anfield has been mooted as a possible destination for the 25-year-old. French giants Paris Saint-Germain are also said to be keen, but any club plotting an approach has been warned that they will need to dig deep in order to get a deal over the line. Ex-Roma goalkeeping coach Negrisolo told Il Romanista on the South American star: “Is Alisson worth €50m? Don’t be silly, he’s worth far more than that. I told Alisson when I met him at Roma’s Trigoria ground that he was born for this. He was already strong when he arrived, but has improved even more since he has been in Italy, especially when coming out low to get the ball. Now he is far more decisive in those situations. “I have to give credit to Marco Savorani, the current Roma goalkeeping coach, who used to work under me. Savorani also helped Wojciech Szczesny improve a lot and Juventus got themselves a bargain buying him from Arsenal. “I know goalkeepers, that is my business, and I can assure you Alisson can be a guarantee for at least another 10 years. He’s already a hero to the fans and Roma need to keep hold of him. Email “Liverpool warned 'Messi of goalkeepers' will cost 'far more than €50 million'”. Feedback on “Liverpool warned 'Messi of goalkeepers' will cost 'far more than €50 million'”.